Privately owned condominium located on Los Muertos Beach. Enjoy a large 2400( including deck) sq ft, third floor, corner unit with wrap around deck. Stainless steel appliances, well stocked kitchen for the cook. New tile kitchen in 2012 Large Master/Guest bedroom each with its own ensuite. Air conditioning in each bedroom. 27' flat panel in guest bedroom. New beds in 2012 American style! This location is walking distance to 'restaurant row' and many shopping opportunities. You can enjoy all the beach front restaurants and bars located all along Los Muertos Beach. Activities coordinator is located outside the building entry to arrange your Mexican adventures including boat cruises, snorkeling tours, zip line tours, eco tours, horseback riding and anything else you desire. You can enjoy a stroll along the Malecon (the famous oceanfront walkway) or lounge on the rooftop pool. Or enjoy a day at the beach under palapa with great service and your toes in the sand! We are farmers from Illinois who have enjoyed staying at Vista Del Sol for years and finally had a chance to buy the perfect condo. We said we would only buy 2nd, 3rd, 4th floor facing the ocean, so when this condo came up for sale we just had to buy. Some of our unique features are our unbelievable sunsets from your veranda and the people watching on the Malecon. Enjoying the fireworks show twice weekly from the 'Pirate Ship' . Listening to the beach Mariachi's (for free!). Many local coffee shops for morning coffee. All the excellent restaurants within walking distance. 24 hour a day English speaking desk clerks, 24 a day gated security and 6 day a week basic maid service, except Mexican holidays (maids do not do personal chores ie: dishes). Large heated roof top swimming pool with pool side bar/restaurant service. Internet, laundry room and room service available from downstairs restaurant. Beach front palapas. Our favorite unit in this wonderful oceanfront building. Great views and ocean breezes from the large wrap-around balcony. All the amenities one could ask for. Newly remodeled pool deck and rooftop lounge areas are top-notch. Host / owners are easy to work with and very responsive. Beautiful condo in terrific location. 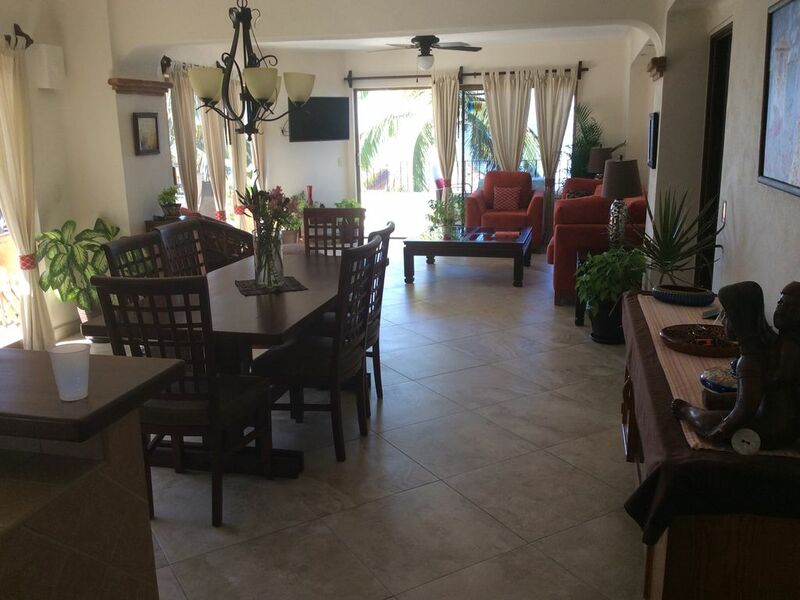 This condo is right on Los Muertos beach and walking distance to anything you would need. Tons of great restaurants and shops and a good swim-safe beach right out front. The condo has three sliding doors that open to the wrap around deck so it is very light and bright. The bathrooms are high end and the beds are very comfortable. There is even a smart tv for those evenings when you need a quiet night in. The building is very safe and the people incredibly welcoming. I would highly recommend this condo!! We loved it and it was our second stay. Beautiful very open and comfortable. Everything about this stay is just too good and now I cannot squeeze us into their calendar. Boo hoo, but I am really happy for the owners and anyone lucky enough to stay at Casa Maíz! We stayed in Mike and Susan's 3rd floor corner unit in Vista del Sol from Oct 25-Nov 4, 2017. What a pleasure it was!! The condo is gorgeous with newly updated bathrooms. The location is perfect, there is no better place to stay .. we even were able to watch the Dia de los Muertos procession along the Malecon right from the balcony! The staff was excellent, per usual, and the rooftop pool was a delight. Mike and Susan were a breeze to work with. Thank you again for allowing us to share in your slice of paradise! Absolutely perfect. Best location on the Malecon and beach. Thoughtfully appointed unit with everything one could ask for. Have rented here multiple times and will certainly return. Owners are a pleasure to work with. Responsive and very accommodating. Walking distance to all restaurants and shopping.